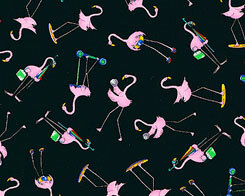 Novelty Fabrics like these are lots of fun, but usually have short production runs and are often discontinued by the manufacturer. My quantities are often limited, so order now if you see one you like. Unless otherwise noted, all fabrics are 100% cotton and 45 inches wide. CLICK on the image to be taken to the Order page. 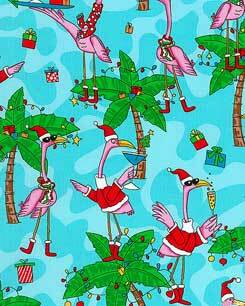 Christmas festivities carry on, even in the tropics, as these flamingos don Santa suits, decorate the palms, and hand out cocktails all over a midnight clear ground. Intoxicating! Taller birds are about 4 1/4 inches. No collection would be complete without the real thing! 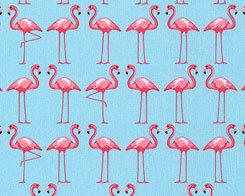 Flamingos are about 4" on a Sky Blue background. Hot Pink, Light Pink, Deep Blue. 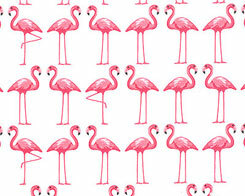 Pop Art Style Cute flamingos on a hot pink background. Hula dancing flamingos with leis and flowers in their 'hair'! 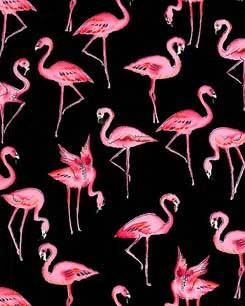 Flamingos are about 4 inches. 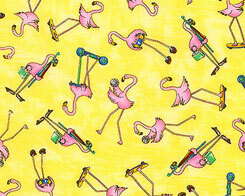 Cheerful retro pink flamingos on a banana cream background. 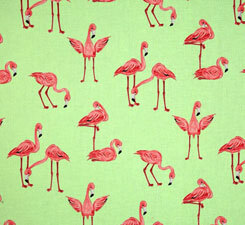 Flamingos are about 4 1/2"." Pink, cerise, palm green on a white background. Flamingos are 2 to 4"." 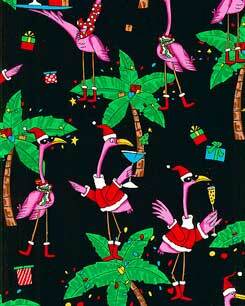 Cheerful retro pink flamingos on a lime background. 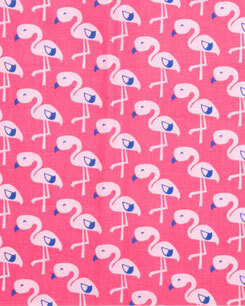 Flamingos are about 4 1/2"." Cheerful flamingos dancing in pairs! 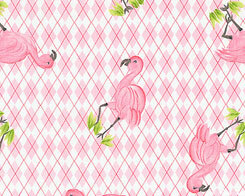 Flamingos are about 2"
Cute flamingos on a diamond background. only a few small pieces left. Email for details. Cheerful flamingos dancing in pairs! 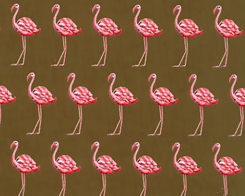 Flamingos are about 2"
Hot & Sugar Pink, Fuchsia, Chocolate Brown. 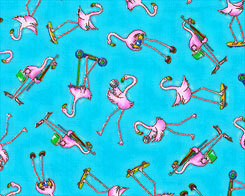 TFlamingo Pink, Black, Bright Green, Cherry Red, Marine Blue, Sun Gold, Azure These silly, pink flamingos are taking advantage of the summer sun at the beach, skateboarding, snorkeling, rafting, playing volleyball, and much more! You would think that they are human! 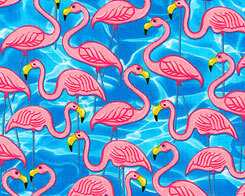 Flamingos are about 1 1/2"
ONLY 1/2 yard left of this discontinued fabric. 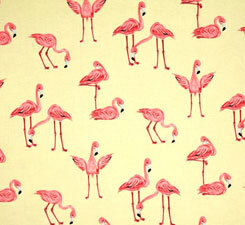 Flamingo Pink, Bright Green, Cherry Red, Marine Blue, Sun Gold, Black These silly, pink flamingos are taking advantage of the summer sun at the beach, skateboarding, snorkeling, rafting, playing volleyball, and much more! You would think that they are human! 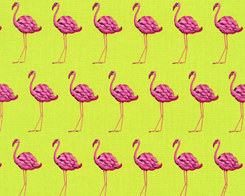 Flamingos are about 1 1/2"
Flamingo Pink, Black, Bright Green, Cherry Red, Marine Blue, Lemon & Sunny Yellow These silly, pink flamingos are taking advantage of the summer sun at the beach, skateboarding, snorkeling, rafting, playing volleyball, and much more! You would think that they are human! 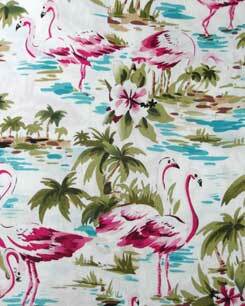 Flamingos are about 1 1/2"
The exotic meets the organized in this whimsical print! 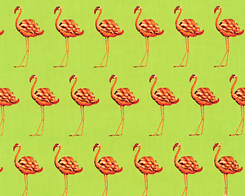 Row after row of flamingos in eye-popping shades radiate off a solid ground in this playful print sure to bring a touch of whimsy to your tropical projects! Flamingos are about 1 3/4". Cerise, Orchid Purple, Magenta, Chartreuse Green The exotic meets the organized in this whimsical print! 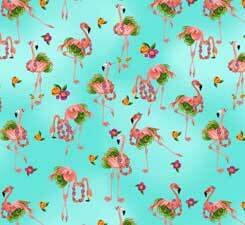 Row after row of flamingos in eye-popping shades radiate off a solid ground in this playful print sure to bring a touch of whimsy to your tropical projects! Flamingos are about 1 3/4".